“We're so used to being told to minimize ourselves,” says Annette Richmond, founder of Fat Girls Traveling. Feeling that both fat people, but more importantly, women, are put into a box when it comes to seeing and experiencing the world, the travel blogger didn’t sit back and complain. She did something about it. Traveling itself isn't really fun for anyone -- transportation options can be limited, destinations overcrowded, hotels and hostels cramped or small -- but for people who identify as fat or plus-size, it can quickly become a rather intimidating experience. And this is all after being inundated with happy-go-lucky people (always thin or fit men and women) breathlessly enjoying beaches, hiking, restaurants, and theme park rides, pushed by travel brands and tourism destinations as the kind of person you’ll see whenever you get to where you’re going. The word "fat" has often been used as an insult by those attempting to bully or belittle people of size, but for many activists, and participants in the body positivity movements, fat is no longer an insult but rather a descriptor of the body they inhabit. Richmond’s intention was to create a safe space for fat women, like herself, to ask questions related to traveling. She also wanted to carve out a place for folks to feel proud of taking up space, no matter where they were on their travels or in their body liberation journey. By reclaiming this three-letter word, fat folks are empowered to remove the negative association attached to it, and for many, the concept of learning to take up space is new and even radical. Richmond wanted to be this guide, to fellow fat travelers like herself. All across the Instagram feed, though, you don’t see these moments. 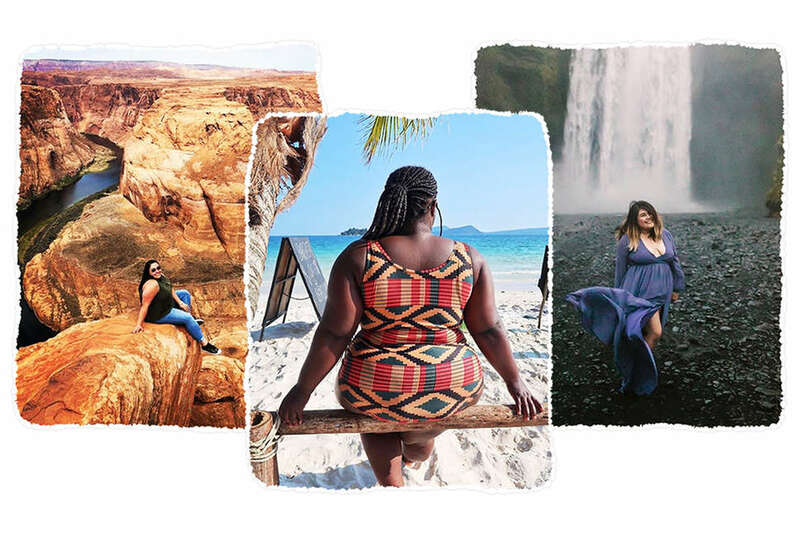 Instead, you’re greeted with bold and beautiful images promoting body positivity in travel. Take user @travelbeyondsize, who went diving off the Paklinski Islands in Croatia. The image is transcendent, with the sapphire blue ocean surrounding her fat body in motion, a huge giga-watt smile across her face. There’s a group of straight-up babely campers at Fat Camp, a fat positivity retreat organized by Richmond and her team being held for the second year in North Carolina, posing with ‘tude on jet-skis. User @stellaboonshoft takes in the Parisian sunshine in front of the Louvre in a sleeveless daisy dress. Or there’s the kaleidoscope image of @allenyashley exploring the Thean Hou Temple in Malaysia, a woman strolling into the heady and delirious riot of colors -- we could go on. The images are bright and editorial in feel -- magazines would feature these poses, these views, these looks… or they should. Because you don’t see larger bodies in advertisements or travel features in Vogue or elsewhere, Richmond herself spends considerable time curating her feed, as much as an editor would, but with her specific mission in mind. “I just decided it was time to make some noise and make sure that they know that we're out here,” says Richmond. She wanted people to pause for thought, and really think about why #TravelInclusivity really matters in the world: Traveling is for everyone, of every skin tone and body shape. Enjoying a beach in a colorful, playful bathing suit is not limited to one type of body, and fat people can hike canyons and adventure through a jungle, too. “Everyone assumes we can't do things just because of how we look, and it's pretty annoying,” explains Samantha O'Brochta, 27, of Brooklyn, New York. As a member of Fat Girls Traveling for the past year, she’s found the community to be incredibly supportive and positive. Fat shaming -- abuse and discrimination directed towards people who are overweight or fat -- can take place no matter where you are in the world, which is why for Richmond it was important to create a space that combats fat hate. She has read the countless articles in the media about fat folks who have been harassed by fellow plane passengers for their weight or had followers share their personal stories about being verbally harassed in the streets about their weight or appearance. Enough was enough. O’Brochta admits this is why she was so happy to find Richmond’s group. ”It's so cool to see that people are actually being able to be bigger human beings and doing things, and getting recognition for it.” For her, it’s nice to finally have space where she sees lots of different body sizes and shapes represented. To not feel ashamed. Carly Heyward, 33 of Atlanta, Georgia has been a member of the group since the beginning, explaining that the group has not only been a huge boost to her confidence but also inspired her to travel more. “I have never felt comfortable in front of the camera because I didn't think that's what people wanted to see,” says Heyward.